Thank you to JLOEB members Harriott Silliman, Jessica Romeo, Tess Costanzo and Randi Ervin for coming out to volunteer at Habitat for Humanity ReStore this weekend! We worked very hard great cause! 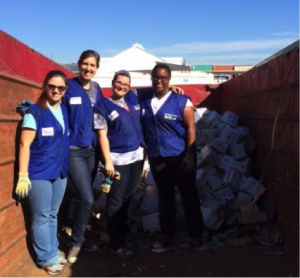 Habitat for Humanity ReStore accepts donations of new and gently used items from individuals and businesses in the community, and sells those items to the public at a reduced cost, usually 50-70 percent of the original retail value. All proceeds go toward building Habitat homes. Through the selling of donated construction and home related items, ReStore increases the number of homes built for low-income families by Habitat East Bay and prevents usable items from being put in landfills. On Saturday, JLOEB members helped to move and sort some of the inventory of the Oakland ReStore location. Our largest project of the day was transferring damaged building supplies that couldn’t be sold to into the dumpster. The supplies were heavy and the JLOEB members were fast and efficient at getting the job done! 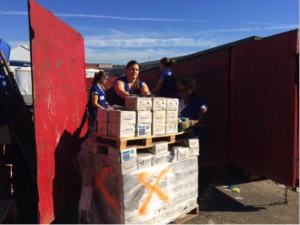 Tess Costanzo, Harriott Silliman, Jessica Romeo, and Randi Ervin take a break after moving several pallets of damaged supplies into the dumpster. JLOEB members formed an assembly line to effectively move the heavy boxes. 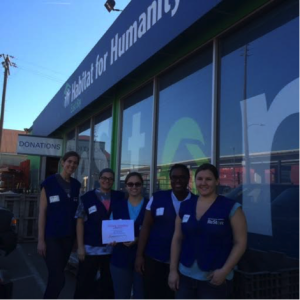 Harriott Silliman, Jessica Romeo, Tess Costanzo, Randi Ervin, and Jennifer Maco in front of the Habitat ReStore where we worked!